While looking through old letters I came across this one and was struck by how it stated that Elizabeth’s letter was accompanied by a portrait of herself for her brother, the King – King Edward VI. 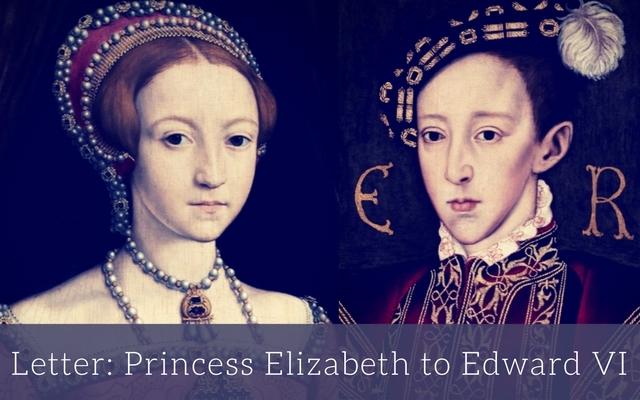 When I read that I started to think about all of the portraits of Elizabeth that I’ve seen over the years, in particular ones during the reign of her brother, Edward (1547-1553). 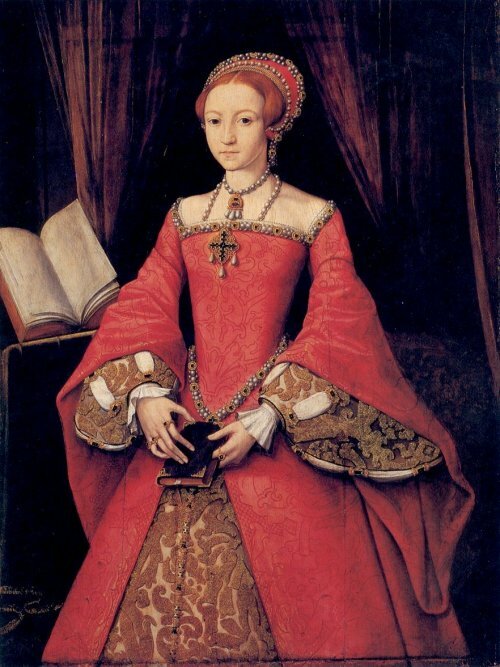 I could only think of one around that time and it would have been circa 1546 – a portrait that Elizabeth had made for her father when she was thirteen. Like as the rich man that daily gathers riches to riches, and to one bag of money layeth a great sort til it come to infinity, so I think your Majesty not being sufficed with many benefits and gentleness showed to me before this time, dothe now increase them in asking and desiring where you many bid and command, requiring a thing not worthy the desiring for it self, but made worthy for your Highness request. My picture I mean, in which if the inward good mind toward your grace might as well be declared as the outward face and countenance shall be seen, I would nor have “taried” the commandment but prevent it, nor have been the last to grant but the first to offer it. For the face, I grant, I might well blush to offer, but the mind I shall never be ashamed to present. For thought from the grace of the picture the colors may fade by time, may give by weather, may be spotted by chance; yet the other nor timewith her swift wings shall overtake nor the misty clouds with the lowerings may darken, nor chance with her slippery foot may overthrow. Of this although het the proof could not be great because the occassions have been but small, notwithstanding as a dog hath a day, so may I perchance have time to declare it in deeds where now I do write them but in words. And further I shall most humbly bessech your Majesty that when you shall look on my picture, you will vouchsafe to think that as you have but the outward shadow of the body afore you, so my inward mind wischeth that the body itself were often in your presence; howbeit because both my so being I think could do your Majesty little pleasure, thought myself great good; and again because I see as yet not the time aging thereunto I shall learn to follow this saying of Horce, “Feras non culpes guod vitari non potest.” And thus I will (troubling your Majesty I fear) end with my most humble thanks. Beseeching God long to preserve you to his honor, to your comfort, to the realms profit, and to my joy. From Hatfield this 15 day of May.